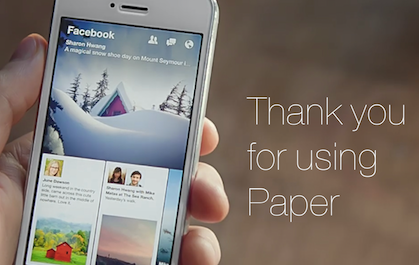 We never heard that much about Facebook's Paper app. It's been around since 2014, but ever since it fell out of the top 1500 apps, it's been pretty much silent. It always had its dedicated users and it could have been a balm for the sting of Facebook rearranging the algorithm in their main app that means users will see fewer news stories in their news feed. Paper was a news viewer so publishers would have had all that space there but now Facebook is closing Paper down. Paper was a good idea to an extent. Unlike Facebook's main app it was a lot of white space and it was an app that people could easily read the news that popped up on Facebook without having to deal with random videos popping up and other people's statuses. It was basically the opposite of what Facebook is trying to become now. However, it wasn't popular and that's probably why Facebook are giving up on it. It fell from the top 300 in the US app store within a month of being posted and by the end of the year had already dropped out of the top 1500. It did have a lot of downloads and a few people who did really like using it over the main Facebook app but it wasn't enough. It's looking as if Facebook is getting rid of anything associated with the team that created Paper though. Late last year Facebook got rid of several other standalone apps created by the Creative Labs and now one of Paper's core engineers has left Facebook after only 3.5 years. We know what Facebook wants to focus on right now and it looks like maybe they realised that they were spread too thin. If they want Facebook to become more personal again with users sharing more original content as well as to be an excellent messenger service, video service and for them to provide great VR then they have a lot of work to do. It seems like Facebook is sticking their nose in everything but maybe they're pulling back a little now. Facebook are saying that they know that some users liked Paper and that they've tried to incorporate features from it in their Instant Articles. In fact, the same team that built Paper created the Instant Article format. Instant Articles are going to appear in the news feed less though and media are feeling snubbed. Facebook have made their decision though and for now, they just want to focus less on the news.